Clicking on this box leads to the LaserSafetyFacts.com/4 page about safe use of a Class 4 laser. August 2014: Changed the web layout so it would work better on mobile devices. Added a laser-to-QR-code icon to the title area. Changed the generic Laser Safety Facts labels (for Class 2, 3R, 3B and 4) to use 0.5 milliradian divergence. This was done because some commercial handheld lasers have divergences less than 1 mrad. Using a smaller divergence gives longer (safer) hazard distances. Note that even the Class 4 label was changed to 0.5 mrad -- despite there being few consumer Class 4 lasers with less than 1 mrad divergence. This was done for consistency; otherwise, the hazard distances for Class 3B (500 mW, 0.5 mrad) would be the same as for Class 4 (2000 mW, 1 mrad) which would be potentially confusing. Added new sections to Class 3B and 4 about “do not use for laser pointing” and children/teen safety. Boldfaced “This is not a toy” on all four generic Class labels. Began using LaserSafety.info domain for human-readable labels, and LSF.me domain for QR and Data Matrix encoding. 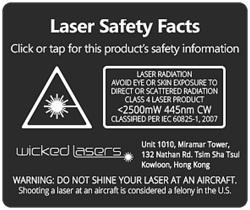 Added text to laser safety disclaimer, stating that a laser may have different parameters than are claimed on the label. Added a few new items on the Links page. July 2014: A major laser manufacturer asks for labels. February 2014: Presentation to ANSI Z136 committee in San Antonio, Texas. February 2014: Presentation to SAE G10T Laser Hazards Subcommittee in Melbourne, Florida. November 23 2013: The Laser Safety Facts concept is developed. Many thanks to the people who gave feedback during the initial development period.